Policies set by school districts to address negative school lunch account balances are drawing headlines, and make clear that it is time to rethink the program. In Kentucky, several parents complained after an elementary school student’s lunch was taken away and tossed in the garbage because of an overdrawn lunch account. A Michigan high school student suffered a similar fate when his account reached a $4.95 negative balance. In Massachusetts, as many as 25 middle school students were forced to dump hot lunches because their lunch accounts were in arrears. The list goes on. When lunch accounts dip into the red, school children across the nation are being denied lunches or offered a paltry alternative, which some have dubbed a “sandwich of shame.” School districts trying to operate within tightening budgets have difficulty absorbing the shortfall, which often amounts to several thousand dollars. Sadly, Iowa school children are also caught in this tug of war between schools that no longer want to carry the financial burden and parents who either won’t or can’t pay off the debt. The Iowa City Community School District has about $35,000 in outstanding school lunch debt. Like many other schools, it has implemented meal policies that treat children differently depending on their age. Such policies are intended to reduce, or at least stave off increases of lunch debt. Elementary school students in Iowa City will always be fed. Accounts for middle school and older students, however, are only allowed to dip to a certain point — the cost of three meals. Once the threshold is reached, students are provided an alternative meal at no cost. In Cedar Rapids, accounts for elementary students can dip $10, and middle school accounts can reach $5. High school students, however, are not allowed to charge. Once the set thresholds have been reached, an alternative meal — cheese or sunflower butter sandwich — is provided at no charge. School officials in Ames are pleased that about $30,000 has been shaved from the more than $90,000 in bad debt from its lunch program. The rub is the policy has also resulted in some students going hungry. A group of teachers at Boone Community School District’s middle school set up an emergency fund for students impacted by a lunch policy change. Under the new policy, which the district says was modeled after the Cedar Rapids’ guidelines, students in fifth through 12th grades are not fed if $25 or more is owed. According to the teacher, the group was not alerted when their emergency account dipped negative and students once again had lunches taken away. The district has since increased its contact with parents about negative account balances, but the larger policy has remained. That prompted a local parent, Karin Sorenson, to begin crowdsourcing funds for the teachers’ emergency account. The successful fundraising effort resulted in a check for roughly $1,150 being given to school administration last month, which, according to the parent, was not deposited into the already established middle school emergency fund but instead placed in a separate, new account that would be used for students in all upper grades. The parent has asked potential donors to hold off until details of the new account are verified. Throughout the country — in Michigan, Vermont, Georgia, and Texas ­­— a host of good Samaritans are stepping up to pay off delinquent lunch accounts. 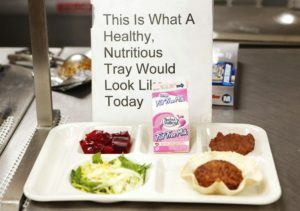 The USDA, which has held federal oversight of school lunches since 1946 (and, since 1966, school breakfasts), is also making changes that can alleviate the problem. The Community Eligibility Provision, or CEP, allows schools with significant rates of poverty to provide free meals to all students. Instead of relying on yearly forms to determine eligibility, existing enrollment in other programs, like SNAP (food stamps) can be used to verify need. When 40 percent of the population is determined to be eligible, the school provides free meals to all students. In Iowa, 531 individual schools across 179 districts have been identified as eligible or near eligible, meaning at least 30 percent of their students are from low income families. There are 93 schools across the state, including Iowa City’s Tate Alternative High School and four Cedar Rapids facilities, that have at least 60 percent of their student populations living in poverty. In addition, several of the districts now updating their policies to crack down on school account debt — including the middle school in Boone and two elementaries in Ames — fall into the near eligible category for the 2015-16 school year, according to documentation from USDA. Statewide 41 percent of Iowa’s roughly 477,000 K-12 students meet the requirements for free or reduced meals. If CEP could be applied at the state level, every child in Iowa would receive free meals at school. More important, we wouldn’t be having a discussion on whether or not it is appropriate to punish or shame children, who have no control over family finances, for their parents’ and guardians’ shortcomings. A healthy lunch, like those provided in our schools, contribute to a child’s academic excellence. Studies confirm that students who skip or don’t receive an adequate lunch are distracted in the classroom. Persistent hunger or malnutrition from habitual undereating can interfere with normal physical and mental development. These are the reasons why, about 70 years ago, the federal government established the school lunch program. Just like public education, it’s an investment not only in today’s children, but tomorrow’s adults. It’s also the reason that new calorie and nutritional guidelines have been established — standards that don’t apply to alternative meals that so many districts now rely upon. Conversations take place daily in Des Moines and school districts about how we can create the best possible learning environment for our children, especially when each enters the system with his/her own set of talents and challenges. Do we invest in advanced courses? Is there a need for more vocational training? Have the arts suffered from the focus on science, technology and mathematics? Yet we’ve neglected the core of what we know, the basics. If we want students to be alert in the classroom, if we want them to achieve their full potential, we’ve got to feed them.